Last week's topic in the MATS A course was Home Decor using suzani patterns to create a set of ceramic plates! I had never heard of the term, "suzani", which refers to a decorative type of embroidered pattern from Tajikistan, Uzbekistan, Kazakhstan, and other countries in Central Asia. I have seen the designs before -- I just never had a name to it. They also remind me a lot of Persian mosaics (the word Suzan is "needle" in Persian) as well as mandalas in Hinduism. For the mini assignment, I looked at a lot of suzani carpets and fabrics, and I drew and painted many more. This was a very difficult week for me, but I think it was all mental. Sometimes I wish I could just turn a switch to stop all the negative voices in my head when I try something completely new and different! I have never done anything in the Home Decor market, and I know next to nothing about it (I know more now after this week and this course though!). And I don't feel comfortable doing "decorative" work. When I was in high school, I was on the tennis team, and something I learned was that the greater part of the game is 'mental', rather than physical. Of course you train and practice, and that is all physical, but it becomes sort of like muscle memory. In a competitive scenario, your mental state can totally determine the outcome of the game, regardless of your skill level of playing. So, this past week, I was reminded of that. I have been painting and drawing for years, but so often I felt like I didn't know how to "mark make" properly because my ability to create anything was clouded by various insecurities and negative thinking. I had decided I wasn't going to let that happen this week, but unfortunately, it did! Also, once I decided to go with my animals, rather than make too much of a change and try to do "decorative" and "adult" at the same time, I started to really enjoy myself. This my first attempt -- totally stiff and I did not enjoy the process at all! This is my second attempt and I had more fun! Again, as with the rooster pitcher in my last post I had a morning "dream" of a tree with circles and different characters in the circles -- like a family tree. 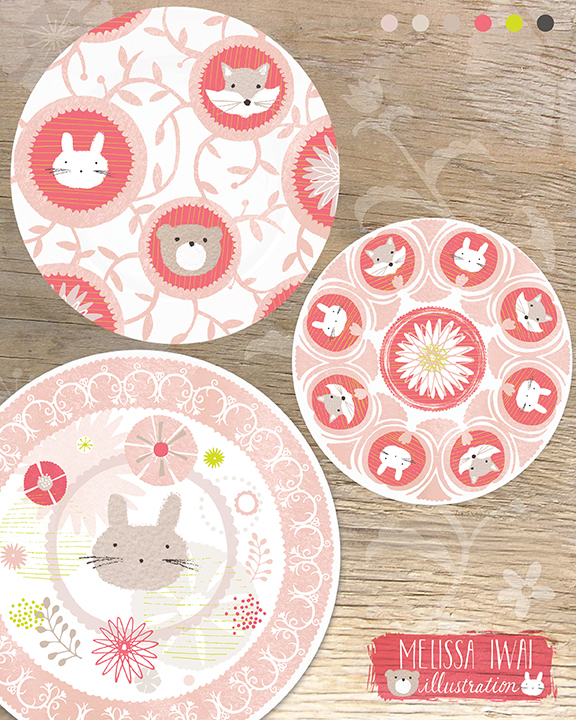 I decided to put my animals into the circles, because we were supposed to design plates that we ourselves would want to use, and I prefer animals to humans on plates! So this my second version, which I was happy with. I couldn't figure out my color palette-- my plates weren't working together, so I took Lilla's color tip that she gave us, and chose some warm neutrals and paired them with pops of pink and acid green. After -- I also got rid of the bear in the center and replaced him with the flower which is found on the tree plate to tie the two together more since they are part of a collection. I had the most fun with my third plate. I think because I was just relieved I had something to turn in (the assignment was two plates at the minimum), and I was able to relax a bit. And I had sooo many icons I never even had the chance to use in my previous two. So I kind of incorporated most of them all in one plate. What a week of ups and downs! It was a roller coaster ride! I learned several valuable things about myself though, and how I work. And, I have a large collection of decorative icons I still haven't used that I can use for other things. Taking inspiration from my friend, Allyn Howard, I also decided to upload some of these designs onto Society 6. They are available there now, so have a look-see at my store! There is a promotional sale going on right now until 11/9 which includes free shipping and $5.00 off! I used this link to purchase make my first "sale" from my store. ha ha. I bought a bunny face pillow case. I will see it every day and it will remind me of the things I learned.